Are your children interested in plants, flowers and all things green? If so, there are so many activities you can involve them in as you take care of the outdoor space you have. It doesn’t matter whether you have a small back yard to an acre of land, there’s sure to be lots to keep the children entertained and useful. Summertime is ideal for sparking an interest in gardening as everything is so colourful and attractive. Once they’ve become green-fingered, this curiosity will then hold strong for all the other seasons. Peruse this guide full of tips for an active summer for all the family in your garden this year. Making tidying up a ‘fun thing’ may seem like a lost cause, but not in gardening. 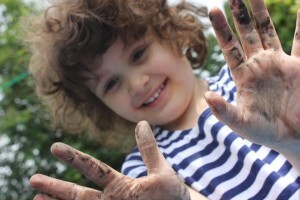 Getting everything into order in the garden involves tools, big gloves and responsibility – all the things that will appeal to the little ones. The key is to have a list of jobs that take no more than 15 minutes each so that the attention spans stay on track. Pulling out weeds, watering a section of plants, finding certain sized pots in your haphazard collection etc. There are so many jobs to do that you’ll be welcome of the help from little hands. These small tasks can be done individually, separating the children off to tackle separate areas, or as a group activity to get them working as a team. It may not always be done to the letter but it will keep them entertained and teach them new skills every gardening session. The Royal Horticultural Society (RHS) has great guidance on what to be doing at each month of the year, along with tips on how to grow your own fruit, veg and herbs. Be sure to give it a look before you head off to the garden centre. For certain parts of the garden, you will need to steer what goes where because of how much sunlight that area gets, what the soil is like etc. but you can still give complete free reign on things such as hanging baskets. These are also lots of fun too as the kids can put lots of brightly coloured flowers in there with quick results. You could also get them learning the names of all the plants; even the scientific names if the little ones are feeling adventurous! E.g. a poppy’s scientific name is papaver. The wonderful thing about gardening is that this is a long term pastime. With some muddy knees and a bit of elbow grease, you and your family can create a beautiful space to be enjoyed all-year-round. It also teaches your children the benefits of hard work and patience. They get to watch how the plants grow and develop and about the care it takes for a gardener to keep everything on track. Plus, they get to play with things such as watering cans and shovels – endless amounts of fun. Getting the kids equipped with the tools they need can also make things very exciting. These children’s gardening bags are so cute and are perfectly sized for tiny hands. After all that hard work, it’s time to show off your beautiful garden with a party. This could be a big garden party, a BBQ, whatever you like. To create a bigger space, and as a fail-safe for bad weather, you can open up the garden and kitchen into one room with bifold doors. If the heavens open suddenly with a huge downpour of rain, you can get people inside put still have a clear view of the garden you’ve all put in the time to show off. Invite friends and family over and let the kids do the talking for you. They’ll be so proud of the fruits of their labour that you can sit back and relax with a pink lemonade while they entertain the guests with a tour of the garden. The children can also impart their new found knowledge of plant names and how to grow their own veg. Plus, you can serve up some of the produce from the garden – grown yourselves!